A quick conversation with Dennis Frederiksen at Fraser Yachts confirms that he' ll be your host in Golfe Juan at an Open Day aboard his central listing, the 51m motor yacht Alibi, on Tuesday, April 27th 2010 from 1pm to 7pm. Alibi was built by CBI Navi in 2005. Lloyds classed and MCA compliant, she can accommodate 12 guests and has plenty of space for outdoor activities. There is a panoramic open deck area with half moon large sunbathing mattresses and an extendable table for 12 guests and a bar. The sundeck boasts large cushions, a Jacuzzi, a U-shaped settee and another table for 12. Alibi also features a gymnasium and a garage that holds a tender, three jets skis and more. Inside this superyacht are six cabins: a full-width master with an office and a Jacuzzi tub, two VIP cabins with Jacuzzi baths and two double and one twin guest cabin all with ensuites. 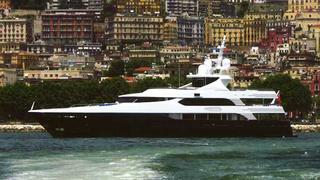 Alibi is asking €23.9 million.